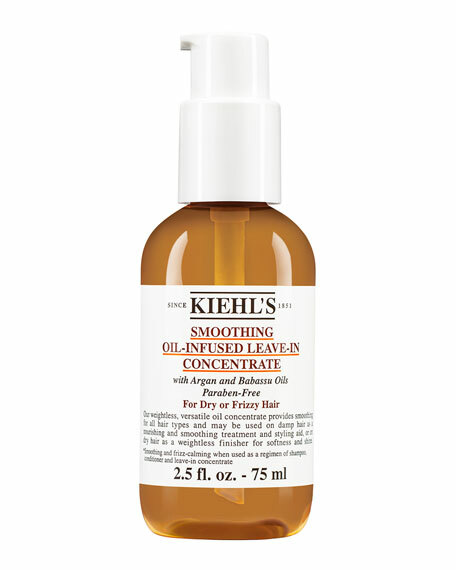 Kiehl's Since 1851 Smoothing Oil-Infused Leave-In Concentrate, 2.5 oz. Our versatile oil concentrate provides smoothing for all hair types; product may be used on damp hair as a nourishing and smoothing treatment and styling aid, or on dry hair as a weightless finisher for softness and shine. Formulated with Argan oil and Babassu oil extracted from Brazilian palm trees, our leave-in treatment instantly transforms hair to a marvelously manageable, smooth, shiny finish.